← Made in the USA? Or not? Walmart laid off 450 employees at its headquarters in Bentonville, Ark., Friday as part of a plan to increase its competitive edge. The cuts were announced in an internal memo sent to both Walmart and Sam’s Club employees by Walmart CEO Doug McMillon. The cuts apply across the organization, to people in salaried, management positions, said Walmart spokesman Greg Hitt. 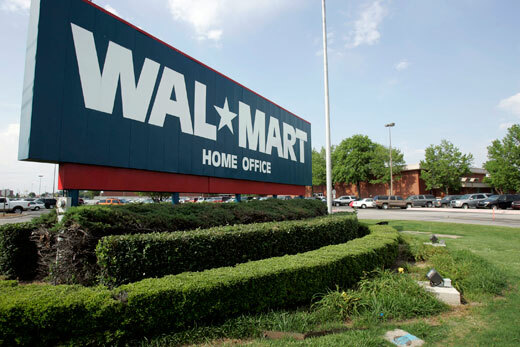 Walmart has more than 18,000 employees at its headquarters. The Walmart layoffs come a little over a month after the company cut its outlook for the year after earnings fell in the second quarter. The big box retailer has been investing more in its store employees this year with pay raises and additional job training, which is proving a drag on profit. Walmart has also been upping its game when it comes to investments in e-commerce, technology and grocery. It announced earlier this week that the ability to pick up online grocery orders at stores would undergo its first major expansion to include eight additional markets. The option is now available in 13 markets, with more expected to be rolled out in coming weeks. Walmart has also been opening more fulfillment centers specifically for online orders as it works to more efficiently and quickly ship to customers. The layoffs come at the end of a week that saw several large companies make announcements about job cuts and shifts in corporate strategy. Whole Foods said Monday that it would be laying off 1,500 people over the next two months as it faces increasing competition in the organic grocery space, including from Walmart. Meanwhile, Sprint is exploring the possibility of up to $2.5 billion in cuts, which could affect the company’s 31,000 employees. Fellow retailer Target has also undergone job cuts this year as part of a $2 billion cost-cutting strategy. It laid off 1,700 employees at its Minneapolis headquarters in March, a week after announcing plans to cut more than 2,000 jobs over the next two years. Overall job growth is also slipping, according to the latest figures out Friday. Employers added 142,000 jobs last month, well below the expected 203,000, while hourly wages also fell and the unemployment rate went unchanged at 5.1%.